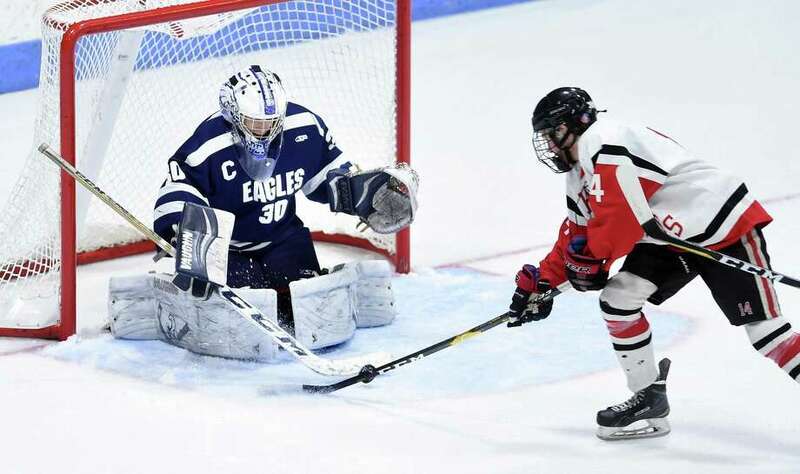 WMRP goalie defends against Samuel Roberts of Branford in the CIAC Division II semifinal at Ingalls Rink in New Haven on Tuesday. NEW HAVEN — Jack Manware isn’t entirely sure how his shot went in, but that it did was something he’d dreamed of for years. Manware’s first goal of two opened the scoring for Branford late in the first period, and the Hornets rolled to a 6-1 win over WMRP on Tuesday night at Ingalls Rink in the CIAC Division II semifinals. “It was so important, for momentum,” Manware said. Manware battled the Eagles’ Brody Davidson for a rebound, sending the puck up in the air. Both players swatted at it in midair, but as it bounced near the goal line, Manware’s second swat sent it home. Blake Kustra’s power-play goal from the base of the left circle, 1:21 into the third, made it 4-1 and all but put it away. Chris Donadio’s rip high-glove on a two-on-one with 8:59 left made it 5-1. Fourth-seeded Branford (18-3-4) will face sixth-seeded Glastonbury (14-8-2) in the final on Monday night, also at Ingalls, at 7. Glastonbury beat Branford 4-0 to open the season on Dec. 12. The Tomahawks beat Farmington Valley 3-2 in double overtime in Tuesday’s earlier semifinal, which delayed the start of Branford-WMRP by over an hour. The Hornets’ only Division II championship came in 1988; they also made the 2012 Division II final, the same year that Glastonbury fell in the Division I final. “I think (this run) means a lot to the school, the community,” DiNapoli said. Ninth-seeded WMRP — Wethersfield, Middletown, Rocky Hill and Plainville — finishes 17-7. “These kids, what they ended up doing is sticking together,” WMRP coach Dennis Tulimieri said. Ben Mroczka got WMRP on the board with 4:59 left in the second, a shot inside the left post after he beat a defender on the right wing. Branford sophomore goalie Jared Yakimoff didn’t let them any closer, finishing with 22 saves. “They make it very difficult to penetrate and get the puck to the net and get people to the net,” Tulimieri said. Manware scored off a Max Bunton lead pass, fighting off Owen Davidson at the blue line and going in alone, 2:04 into the second. Spencer Engstrom’s rip from the right faceoff dot, moments after the Eagles ripped one wide, made it 3-0. Bunton scored on a rebound with 3:05 left to finish the scoring. Records: WMRP 17-7; Branford 18-3-4. Goals: WMRP—Ben Mroczka; B—Jack Manware 2, Spencer Engstrom, Blake Kustra, Chris Donadio, Max Bunton. Assists: B—Donadio, Robbie Lionetti, Bunton, Jake Rivera, Engstrom, Manware, Zach Jones. Goalies: WMRP—Jake Peckrul (28 saves); B—Jared Yakimoff (22). Shots: WMRP—34; B—23.